Located in the beautiful southwestern Colorado mountains, we are life-long residents of Colorado. We are Carl and Carol Gray, of Cortez. Our 32-years of marriage has brought us seven sons and two daughters ranging in age from 14 to 32, along with 7 grandaughters and 2 grandsons. Our Newf's are raised in the country with a large fenced yard, and enjoy the comfort of our home. Our pups are handled lovingly from birth. We do our best to provide puppies with the healthiest environment. All pups are played with daily, loved and cuddled! Our puppies will be ready to share their affections and devotion with you! We currently have five adult dams and 2 sires. We are not a puppy mill or kennel; we are keeping our number of Newf's manageable to allow us to give each of them the individual care and attention they deserve! Most canine breeds have their own particular health problems. With Newfoundlands it's hips, hearts and Cystinuria that require particular attention. Even among the best bloodlines, genetic and health issues can potentially develop. 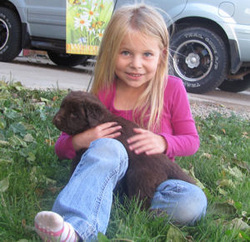 We are committed to providing healthy and loving companion pups from sound bloodlines.